As my 40 week mark came and went, I was feeling desperate and completely miserable. Everything ached, the random contractions were getting tiring, my moods were unstable it seemed. Feeling so desperate, I decided to try one last old wives tale (after trying many) to naturally induce labor. I spoke to my midwife on Wednesday and she agreed that I could try castor oil on Friday morning. I knew the side effects. I was willing to risk them to get this baby out of me. Thursday came and Toby took me to the mall to walk. At this point, the pelvic pressure I felt was unreal so we only made it like a lap and a half. So we had lunch and came home. 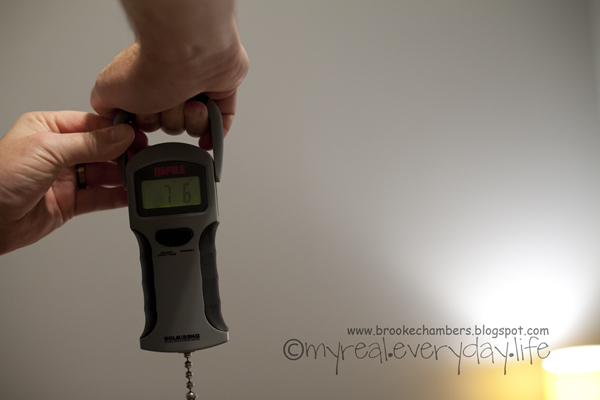 I had a few contractions here and there that caused me to slow down. Friday morning came and my midwife brought the goods. the nasty nasty goods, mixed with a milk shake. It took several hours for it to kick in and even then, everything was very mild compared to what I had expected. I thought I'd be in gut wrenching pain and glued to the bathroom. Not so much. Which I was very thankful for. 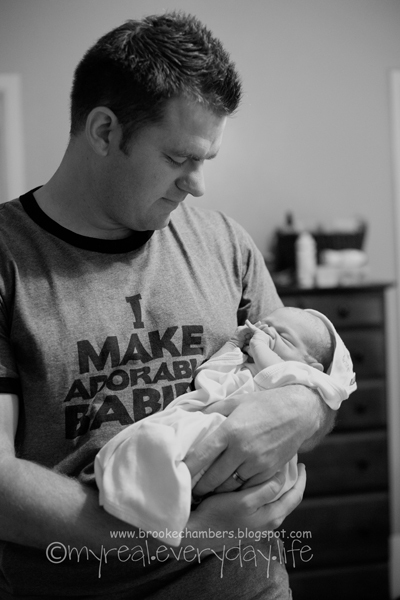 Later that evening I started having very mild contractions about five minutes apart lasting about a minute. This went on for over an hour. I even called my Mom in Oklahoma (10 hours away) and they loaded the car and headed this way. A little later, the contractions slowed, then stopped all together. I called her back, and she made the decision to go ahead and drive down here. They drove over night and got to my house around 8:30am. Saturday, just before lunch, my Mom, Nanny, and I headed to the mall to walk around and do some shopping. We ate lunch and walked the length of the mall going into several stores. I had a few contractions here and there, strong enough to slow me down once again, but nothing ever consistent. We came home, ate dinner, rested our tired feet. Suddenly my stomach got so upset, I had chills and felt so sick. It passed very quickly and only happened that once. We went off to bed pretty early, but I couldn't fall asleep til close to midnight. Nothing new lately. At some point I had two or three contractions that were strong enough to wake me up and I rolled over with each one. Finally, I checked the clock and decided to time them. It was 2:29am. The next contraction I timed, and the rest after that. They were about three minutes apart lasting about a minute. I got up and walked around to see if they'd stop. At 4am I realized it was the real deal, nothing was stopping them. So I called my midwife and told her what was going on and she headed our way. It took her about 20-30 minutes to get here. As I called her, Toby had to leave to head to the church and turn some things on for church that morning (his co-workers that would normally do this for him in this situation are all out of town on vacation). I told him no big deal because the midwife was still some time out and, you know, surely we still had a good couple of hours to go. We decided he best go then that way when I deliver in a couple hours, it wasn't too late. Before the midwife got here, and while Toby was still gone, my contractions went from manageable and not really getting more intense to all of a sudden transition contractions. It was like they came out of nowhere. All I could do was try to breathe and say God get me through this. I had mentally prepared for these. Each one I prayed the same thing. My Nanny had to hold me up at some point, I felt dizzy from all the deep short breaths. I remember saying I waited too long to call and I could feel the head. I kept saying I need Dawn (my mw) and I need Toby. I vaguely remember calling Toby and telling him to get back now. Remember, this was all in about a 20 minute period from the time he left. 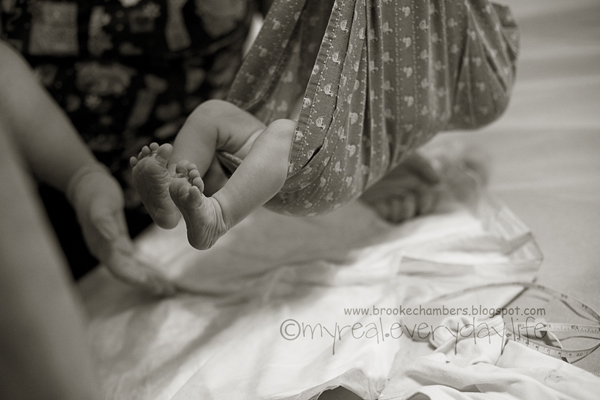 I also tried to call my birth photographer between the regular contraction and the first transition contraction I had. Once that puppy hit, I couldn't think straight except that I had to get through that contraction. So I gave up and just focused on making it through the rest of the labor. Dawn finally made it and I know it wasn't very long after transition started, but I was so glad she made it. She was so calm and started telling my Mom and Nanny what needed to be done. They got the bed ready, she put waterproof pads under my feet. (I labored standing the whole time, any other position was much more painful). Finally, my Mom called Toby again and he was just at the corner of the street. He ran in in the middle of a contraction and I grabbed his arm. Just before he walked in the room, my water broke and my plug finally came out. It was a tiny little puddle. Baby's head was right there, I could feel him. The next contraction came and I pushed, and his head came out so fast. He immediately started crying. I pushed again immediately, and his little body came out. Dawn wrapped him and put him through my legs for Toby to grab. He handed the crying little bundle to me and I finally sat down on the bed. And just a few minutes later, baby latched on and started nursing like a champ. He was eager and ready. He was born at 4:49am. Two hours and twenty minutes after labor started. I know I kept saying this is happening so fast throughout the hard part, too. It was fast, too. Once labor started, there was no stopping that boy. I gave birth standing beside his bed in our room. It was amazing. 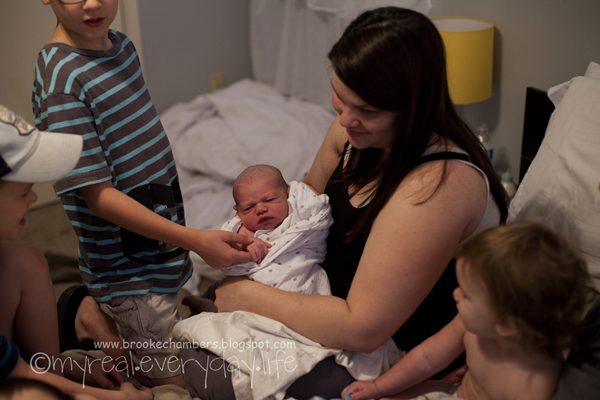 The best birth experience I've ever had. He was perfect. 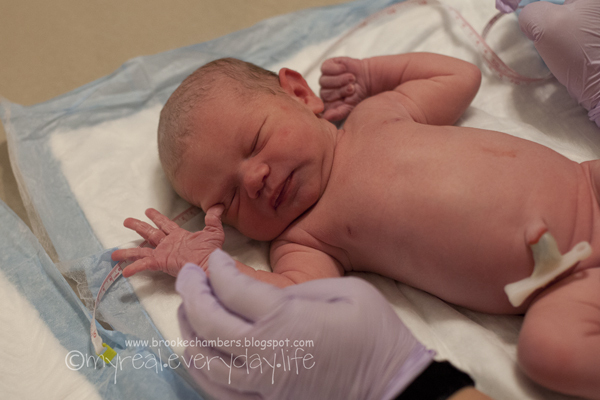 No needles, no invasive checking, no shift changing nurses, my body knew exactly how and when to give birth, and I didn't even tear. It was perfect and totally more than I could have ever dreamed. And oddly, he was born on the date I playfully guessed at. Greyson Parker Chambers, born July 8th at 4:49am. 7lbs 6oz, 20 1/4in long. Daddy got to weigh his boy. After Dawn left, two hours(ish) later, I got some rest and nursed Greyson some more. 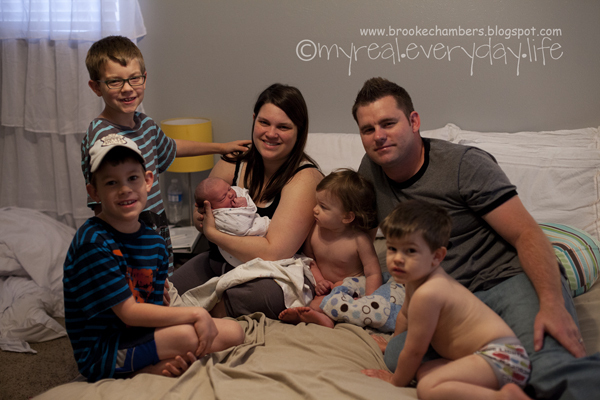 When I woke up, we had the boys come in to see their baby brother. This is where the tears hit me. As the boys trickled in, I couldn't stop crying. My complete family. We are whole and completely heart-full. Thank you for all who prayed and sent love and sweet words. We could not be happier with him and how all things played out. God is the Great Orchestrator and He has perfect timing. Absolutely perfect. Oh my goodness! The tears started flowing as soon as the pictures showed up. I am so happy for you! Congratulations again! You are amazing Brooke! God is so wonderful and you're right, His timing is just perfect!! Oh Brooke, I can't help but tear up reading this. I'm so happy for you: happy that he finally came and you can see his sweet face, and happy that you got to experience such an incredible home birth. Congratulations Brooke! :) I giggled when I read that you took the castor oil, I so remember that feeling of desperation! And it sure does work! Your story is so awesome, God so in control... and your sweet hubby barely made it back in time! I have to tell you, after our second (the one who was born in the car, less than three hour labor) I immediately said, "that was the easiest thing I have ever done". It sounds like you had a really amazing experience. Despite it's reputation, giving birth can be so incredible! Congrats again, my friend. I am so so so happy for you, that everything worked out so perfectly and that you have your beautiful new babe to love on. Lucky Mom of boys! :D I only wish we lived closer so I could visit you.